Colour Coded is the latest in the collection of designs from MillaMia. MillaMia as a brand is particularly close to my heart as it is the first commercial brand that I stocked following getting our own yarns spun. As early as 2009 I think I was toying with something in my head….I went to the Knitting and Stitching Show at Harrogate in November of 2009 and discovered the two Swedish sister’s behind the MillaMia brand. They were so inspirational. I bought the first of their book collections, Bright Young Things. I said in my head that if I ever had a wool shop I would stock MillaMia….a year later I was getting our own fleece spun! At the time I met the MillaMia girls, my little girl was only 3 years old and the collection was perfect…bright and funky! The MillaMia yarn, 100% extrafine merino is so soft and bouncy I would have no hesitation putting it on a new born baby, I had no complaints from my little girl about…you know, the usual itchy, stiff, hot, bulky! It is wonderful to knit with and wears and washes brilliant too! 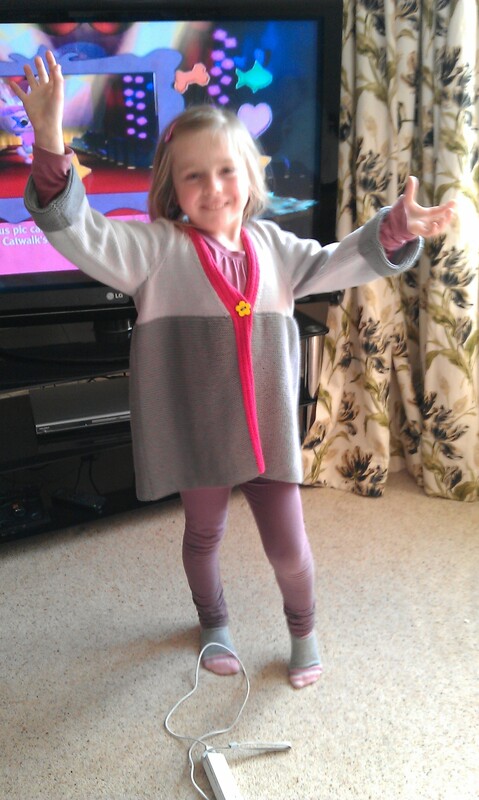 I made the Lovisa Cardigan from Wonderland for Katie when she was 5, she’s 7 now and it still fits her and my 15 year old has even tried it on and could have ‘almost’ got away with it so I think it’s one that will be around for a few years! The Lovisa Cardigan has been really popular and I was delighted to see it has appeared in the latest adult collection Colour Coded, but re-named as Annika! Lovisa (child sizes in Wonderland) knits with 3 – 5 balls of the main colour, 3 – 4 balls of the second colour and 1 – 2 balls of the contrast. Sizes range from 2-3 years to 5-6 years, I knitted the age 5-6. Annika, the adult version knits with 8 – 11 balls of the main colour, 6 – 8 balls of the second colour and 3 balls of the contrast. Sizes range from 32″ to 44″ so a massive range of sizes! !….I particularly like the Petal/Fushia with Midnight contrast! MillaMia is available in 17 shades so colour combinations are yours for the taking, I don’t think there are any combinations that don’t work!